Hey everybody! I'm just peeking my head around from a huge pile of boxes for a quick update. We've spent the last week moving from one Brooklyn walk-up to another, in the late August heat. Oy, what a week. I'm happy to report, though, that everything (including every last bit of wool) has made the journey safely - now there's just the matter of unpacking, which is actually the fun part. Knitting has been almost non-existent for obvious reasons, but I did grab a skein of my handspun to cast on for a small project to keep around for sanity's sake. This is 4 oz of pure merino from Amy over at Spunky Eclectic that I spun up to be a worsted weight 2-ply. I prepared the fibers so that it would be self-striping. I love how the colors go together. I've really had BSJ on the brain and when the finished yarn came off the wheel I knew these two were destined for each other. I'm hoping I can squeeze one full baby surprise out of this skein. We'll have to wait and see. In the meantime, I'm enjoying every stitch. Limited couch space and all. In other BT-related news, a knit-a-long has been started up for the Hemlock Ring Blanket. I've been absolutely overwhelmed at the response to this project, I'm glad to see so many wool flowers blooming all over the world already. If you'd like to join the KAL, visit the start page here and sign up. If you've been thinking about starting one of your own, I'm sure this will give you just inspiration (temptation) you need. Sorry to drop by for such a short time - I hope to be back to regularly scheduled programming very soon. Enjoy the long weekend! Awesome, awesome BSJ, and gorgeous colors. What a great use for the handspun. Drop by for as long or as short a time as you can spare. The tea pot is always on here in BC. I moved 23 times, and I agree the fun part is the unpacking and 'building your nest' around you. Do you have those pictures or pieces or furniture that have been in so many different rooms in your home that they have an identity crisis going on? Love the colours of the BSJ! At least the worst part of moving is over. so pretty it almost makes me want another baby, almost! Lucky, lucky baby that gets that gorgeous BSJ. I got a November chill and smelled pumpkin pie just looking at it. Glad the hard part of moving is over; have fun with the unpacking and post whenever you get the chance. We WILL be here, eagerly waiting to see what beautiful and fantastic item is flowing off your needles! The handspun is beautiful - and the baby jacket is so sweet. 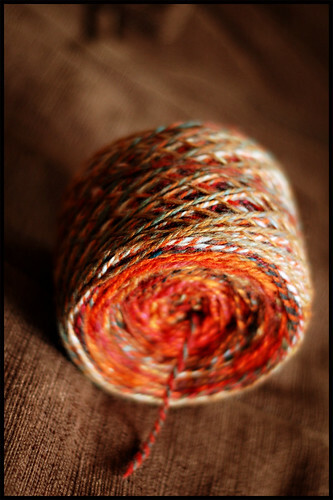 I think I love your photography as much as the yarn itself! 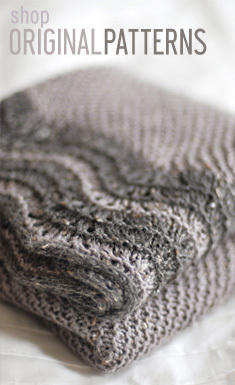 Your yarn is gorgeous and there's no better way to use it than BSJ. Wow, I hope that baby was mine. "And how long exactly have you been spinning?" Ooooo..I love your spinning. It must fly with a spinning wheel. Sadly, my hubby wants me to wait until Christmas. So here I am, sitting atop my mountain of roving spinning a little drop spindle doing a little victory dance every time I've made it through an ounce. I love the colors on your sweater! They sure are spunky...and eclectic. :D The throw is gorgeous too. I'm so tempted to join your KAL. 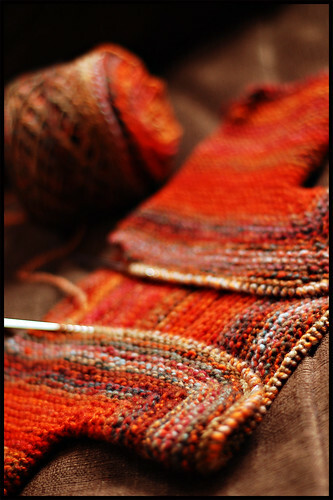 I love how the striping is working out in your BSJ. I've been admiring your photography too... I like the use of narrow focal range, lighting, angle, etc. I just sit here and go "oooooo" every time a new photo comes up. Thanks! The colors of your yarn are just stunning--my favorites, in fact. It will be beautiful. I love the Hemlock, and I wanted to begin it. Now, I'll have an opportunity. I don't think you realize how much people admire your work. You are very talented. Hurry back! P.S. Please, spin some more of that colorway and sell it. I want some, badly. Your handspun and your photos are magic. It warms my heart to see EZ alive in our hearts. ooooh ... i've done the manhattan moving thing in serious summer heat, from a 5 floor walk up (doesn't that mean you live on the 6th floor ?) i think i died that night. okay. i didn't die. but, i thought i might after driving out of the city on the way back to nc, in the wee hours. could. not. keep. the. eyelids. open. What a beautiful BSJ! The colors are to dye for!! Thanks for the push for the Hemlock blanket, 2nd I've seen this week so it must be a pleasure to knit! You are one talented dude. the BSJ looks gorgeous in your yarn. I love that a small project for you is a sweater. That's fabulous. For me, it's a ribbed scarf in the cheapest yarn I can find. Glad to hear the move went well. You spin, knit, design patterns, take beautiful pictures, write a interesting and funny blog, please don't tell me you cook too. Have fun unpacking a great way to organize. I love seeing baby clothes in non-traditional baby colours. I love how saturated and rich your handspun looks. Hope you're snuggly and comfy in your new home! I don't spin and I am so jealous of the BSJs you've knit using your handspun. they are yummy. 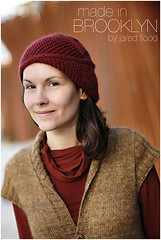 Tell us how many yards you have in that yarn and if you make the complete jacket with it. That would at least give me a clue as to how much I might purchase from some fine spinner. Oh-oh . . . I am really turning green. I saw over on Ravelry that you've already finished this! My goodness that was quick! The pattern is, of course, genius; and your yarn is, of course, beautiful! I love the handspun and the BSJ! I just wish I could learn to spin here in Spain, but haven't found a place yet. In the meantime, congratulations on the wonderful yarn and knitting and my best wishes for a great life in your new apartment. Hope you'll have a nice yarny housewarming! happy new home! I'm such a fan of handspun BSJs -- yours is lovely. I love it! I'm so glad you're making BSJ. I started one just because I wanted to, knowing absolutely no babies being born around now or expected, and my boyfriend found this hilarious, until I showed him yours as well. Joy and friendship for your new home - always a lovely time nesting in! I keep showing my camera your blog in the hope it inspires it to do better (nothing to do with my pointing and clicking of course. Just dropping in? 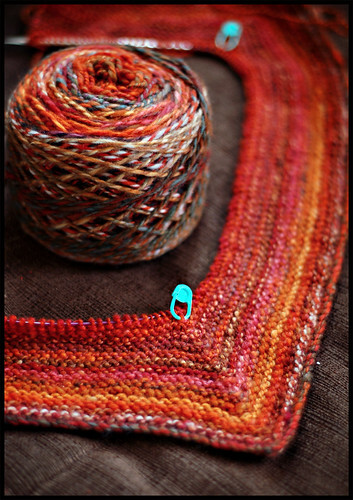 You've left beautiful yarn, BSJ and photos along the way! That yarn looks amazing! Such a cute baby sweater - where is that pattern from? I'll have to do some research to find it. It's adorable. I'm not surprised there is a KAL started for Hemlock Ring Blanket - I've had it on my mind ever since I saw your post. Once I get some of my current projects of my needles I'm going to start one for sure! J. I am still awestruck by your big lace. What a cool idea; it is very, very beautiful. like always - your spinning, your knitting and and your photos are so inspiring! Thank you! That red+ handspun has captured my heart. I'm impressed you're knitting with your handspun already. Your BSJ is looking mighty lovely, too. BSJ does well by handspun. The yarn is gorgeous as well as the pics. Thanks for sharing. Gorgeous yarn - I love those colors! All I can say is wow! your yarn is amazing! KAL for hemlock ring blanket! Whewre? When?